The blog of Christian Heights United Methodist Church. Where Everybody is Somebody Special! All are welcome to join us for all publicized events. Scripture quoted by permission. Quotations designated (NET) are from the NET Bible® copyright ©1996-2006 by Biblical Studies Press, L.L.C. www.bible.org All rights reserved. 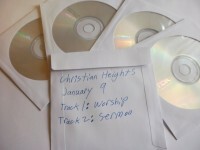 The worship service at Christian Heights is recorded every week. The recording is edited and then distributed via the Internet and on CD. Full sermons are published on-line with permission from the speaker. For shut-ins and those otherwise unable to attend the worship service we distribute the full worship service on recordable CDs. The disks are playable in nearly all CD players. The recordings are formatted in two parts. The first track contains the worship service leading up to the sermon. The second track begins with the sermon to the end of worship. Disks can be delivered to people living in Hopkinsville. Contact the church to setup delivery. The MP3 sermons posted on-line are available world-wide.